The William Blake Archive is pleased to announce the publication of an electronic edition of the Songs of Innocence and of Experience Copy E. This copy, prepared in 1806 especially for Thomas Butts, Blake’s patron, is in the Huntington Library and Art Gallery. Complete copies of Songs consist of 54 impressions; due to the way Blake assembled Songs Copy E, it has 54 impressions, but it is missing “The Clod & the Pebble” and has duplicates of “Laughing Song.” Almost all the impressions were printed from various print runs, with most of the Innocence impressions coming from the raw sienna and yellow-ochre printing of 1789 (see Innocence Copy B in the Archive), and its Experience impressions coming from the yellow-ochre impressions that form Experience of Songs Copies B, C, and D, printed in 1794 (Copies B and C are in the Archive). Songs Copy E also includes eight impressions printed in the same green ink on the same paper and with many of the same accidentals as those in Innocence Copies I, J, X, and Innocence of Songs Copy F, printed in 1789 (copies I and X are forthcoming and F is in the Archive). As a result of these various printings, Copy E has two copies of “Laughing Song,” one in Innocence, on the recto of “Little Black Boy,” and one in Experience, on the recto of “The Little Girl Lost,” which Blake originally printed as an Innocence poem but had moved by 1794 to Experience. 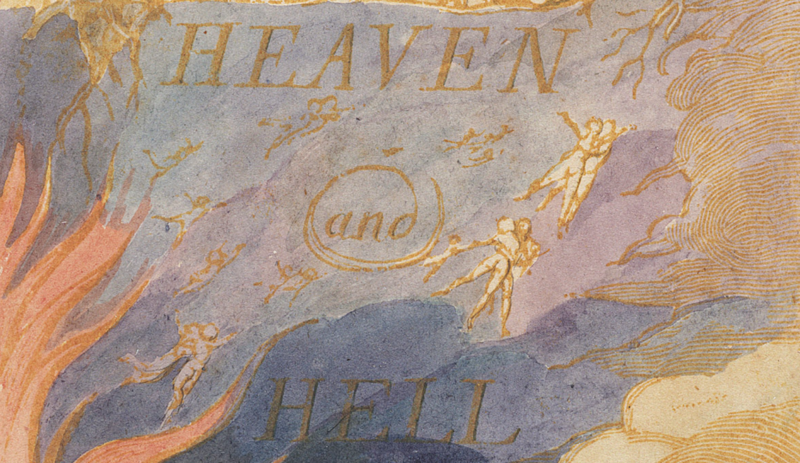 To complete Copy E, Blake printed “A Dream” and “To Tirzah” in dark brown ink on one side of the leaf and numbered them “28” and “54,” ending Innocence and the entire series respectively. Much later in the nineteenth century, an owner of the copy added a posthumously printed copy of “The Clod & the Pebble,” which is included here as the final plate. Despite its impressions having been printed in various styles and inks, Songs Copy E appears visually coherent—unless one looks closely. Blake colored the impressions with watercolor washes when he first printed them, and then, around 1806, just before he sold the copy to Butts, he recolored them in his late style, in which texts are lightly washed, words traced over in pen and ink, and unprinted plate borders penned in. The impressions, however, were not refinished (or freshened up) merely to make them cohere visually, or to justify the copy’s £6 6s. selling price. They were worked over because they had to be, for most were printed poorly. The legibility of many of these impressions depends entirely on texts being overwritten in pen and ink. In Innocence, twelve of twenty-eight prints were overwritten, and most of these were overwritten completely. In Experience, five of the nineteen yellow-ochre impressions were completely overwritten and most of the others have letters and words touched up. “Nurses Song” in Experience printed so lightly that Blake printed the plate twice in an attempt to darken the text. The register was off in the second printing, slightly below and to the left of the first printing. The result is a double image, particularly noticeable in the vines and leaves right of the first stanza and between the two stanzas. For a full description of this double printing, see Robert N. Essick and Joseph Viscomi, “An Inquiry into William Blake’s Method of Color Printing,” Blake/An Illustrated Quarterly 35 (2002): 74-103. Had the impressions been left as printed most would have been illegible and indistinct. The designs that printed well were not outlined. In fact, very few of the designs in other copies of Songs or Innocence produced in these printing sessions were rewritten or outlined, even though many would have benefited from such treatment. Apparently, the impressions that most needed to be salvaged were the last chosen to form copies, which may explain why those used for Songs Copy E were still in the studio in 1806, thirteen and sixteen years after they were printed and after most of the other copies from their editions had been sold. Nevertheless, Blake’s care and attention upon revisiting these old prints yielded one of his most beautiful copies of Songs. Like all the illuminated books in the Archive, the text and images of Songs Copy E are fully searchable and are supported by our Virtual Lightbox and ImageSizer applications. With the Archive’s Compare feature, users can easily juxtapose multiple impressions of any plate across the different copies of this or any of the other illuminated books, and with the Lightbox, users can examine images from any of the works side by side, as well as crop, zoom, and juxtapose them for close study. New protocols for transcription, which produce improved accuracy and fuller documentation in editors’ notes, have been applied to Copy E and to all the Songs texts previously published. With the publication of Songs Copy E the Archive now contains fully searchable and scalable electronic editions of 80 copies of Blake’s nineteen illuminated books in the context of full bibliographic information about each work, careful diplomatic transcriptions of all texts, detailed descriptions of all images, and extensive bibliographies. In addition to illuminated books, the Archive contains many important manuscripts and series of engravings, sketches, color print drawings, tempera paintings, and water color drawings.